Since the early part of 2010, Intesym has been a pioneer of structural analysis on mobile touch-screen devices such as the Apple iPod touch, iPhone, and iPad, combining affordable, fast, and sophisticated 2D, 3D, static, and dynamic structural analysis with the convenience of a pocket calculator, perfect for use on site, in meetings, on the train, or even to replace a PC. Packages range from Beam for quick beam analysis through to the flagship Space Frame 3D app capable of P-Delta second-order static analysis and natural mode dynamic analysis. All of our apps have a strong emphasis on ergonomic interaction and concise graphical representations. For all iPhones, iPod touches, and iPads with iOS 5.1 or higher. Aids international use by minimising language. Choice of UK, European, and American measurement units and technical labelling. Geometry and loads may be edited numerically or by dragging with a finger. WYSIWYG: No need to consider node or member numbering nor whether a force is +ve or -ve. Integrated extensive multi-national section library. Integrated custom section generator for non-standard sizes of common shapes. Results computed continuously in real-time as the model is being edited. Envelopes and deflected shapes are drawn with smooth curves and sharp discontinuities. Results available at nodes and at any position along members. Points of interest automatically determined for every member, for quick single-tap access to points such as maxima/minima. Rotate, pan, and zoom the view with simple finger drag gestures. Integrated calculator for numerical input, including trigonometrical functions. “Undo” function to correct mistakes. Model size limited only by available RAM. Airprint† and e-mail export of comprehensive graphical results via PDF (*). Save, load, and transfer models between CASA Apps and our desktop CASA-M and CASA-IV (*). Integrated manual and help with Airprint† facility. Replay demonstrations: animations with detailed annotations and explanations, acting out the touch-screen taps and gestures to show how to use the apps and how to build/edit models. (†) Airprint is only available on devices with supporting OS and hardware. (*) CASA Intuition provides only normalised analysis results (not actual), and lacks model exporting. Member major-axis orientation towards nodes. Depict extraneous structures for annotation and context. Multiple copying for large-scale generation of repetitive substructures. Choice of wireframe and solid rendering with easy switching. Solid colour-coded rendering of geometry. 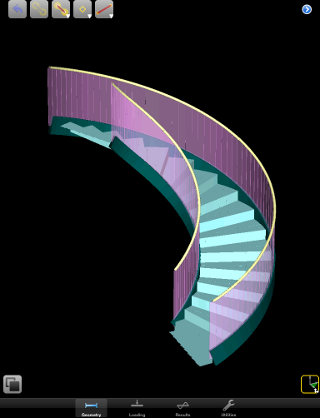 Through the use of groups, the stair may be analysed both with and without the balustrade. Simply tick the P-Delta box on a load-case combination to have the second-order effects of loading on the deflected shape taken into account. Factored self-weight and additional applied masses. Mode shapes and frequencies determined. Impulse and transient response to footfalls on floors and stairs. CASA-M is a complementary desktop program similar to Space Frame L.
Please see our selector guide for a comparison between CASA-M and our mobile Apps. Flagship Structural/Civil Engineering App for general 3D space-frame analysis. Go to CASA Space Frame 3D product page. Includes a short tutorial. Structural/Civil Engineering App for general 3D space-frame analysis. Structural/Civil Engineering App for general 3D space-truss analysis. Structural/Civil Engineering App for general 2D plane-frame analysis. Structural/Civil Engineering App for general 2D plane-truss analysis. Structural/Civil Engineering App for general 2D plane-grid analysis. Structural/Civil Engineering App for 2D concatenated beams. Structural/Civil Engineering App for single-span beams. Structural/Civil Student App for the study of 3D space-frame behaviour.